This oxygenating, anti-oxidant facial mist creates a protective layer on the face. It prolongs makeup wear and moisturizes. It is recommended for all skin types. Shake before using. Spray evenly while holding about 12 inches from face. Use after the P50 lotion. Use to brighten and refresh all throughout the day! 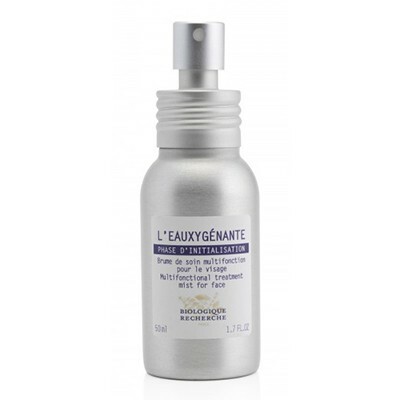 This moisturizing mist is composed of Edelweiss extract and Specific Biologique Recherche Oxygenating Complex. This facial spray respects the epidermis’ acid pH and is recommended for all skin types. Shake before use. Hold the bottle about 12 inches away from the face and spray on as a mist: after using the recommended P50 balancing exfoliator, to rinse off Lotion P50W, to rehydrate the skin after removing a mask, before and/or after a cream or as a mist over make-up to brighten the complexion, or to refresh instantly at any time of the day.